When Britain's largest military band, The Band of the Life Guards based at Combermere Barracks, Windsor, relocated to the Army Reserve Centre, the new location was not acoustically suited for music rehearsal, so Black Cat Acoustics was called in for advice. Although the ARC provided more space for the band, currently with 68 musicians, the structure of the drill hall and the gymnasium that formerly occupied the building had very reflective walls and ceiling giving rise to noise and echo problems that without acoustic treatment rendered the space unsuited for the musicians' rehearsals. Black Cat Acoustics recommended a series of special treatments to create an ambience and acoustic quality that dealth with the noise problems and allowed the band to take advantage of the alrger space that they required, but now in an acoustically friendly environment. The work, which was completed on time and within budget, included the addition of acoustic panels, both wall mounted and suspended from ceiling, that reduced the Reverberation time (RT) to approximately 1.5 seconds from 4.5 seconds. In addition acoustic dampening walls were installed between the band rehearsal room and two other military secure areas. Four acoustic door sets separate the band rehearsal room from the social club, office corridor, stores area and museum corridor. An acoustic barrier and absorption curtain over a roller shutter door helps muffle sound travelling through the shutter door and also assists in the internal acoustics of the rehearsal room. Additionally the contract included a large Wenger StageTek staging system 14.6m x 4.8m (48ft wide by 16ft deep) comprising two tiers at 0.3m and 0.6m (12" and 24" heights). 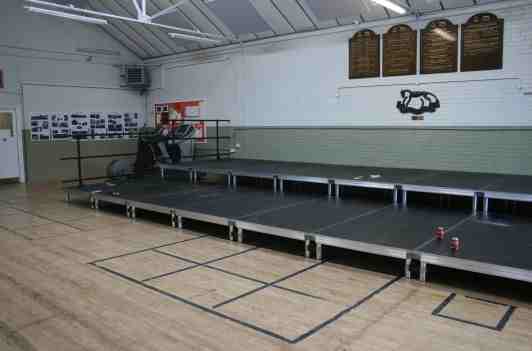 This staging is also designed to be re-configurable in various layouts to suit the different band requirements. The move and store carts allow all the staging components once disassembled to be transported and deployed off-site when the band(s) play external functions.